The Wall Street Bull, a famous, iconic symbol of the financial district, underwent a bit of an involuntary makeover during the holiday season, as NYC based artist Agata Olek outfitted the bronzed beast with a garish pink and blue crocheted sweater in guerilla fashion on December 27th. The Charging Bullâ€™s fashionable display lasted a mere two hours and it fell in line with the seasonâ€™s tradition of ugly holiday sweaters. However, Olek said that the sweater was a gift to NYC and that it was a tribute to Arturo di Modica, who illegally put the bull on Wall Street during Christmas of 1987 following the Stock Market crash. 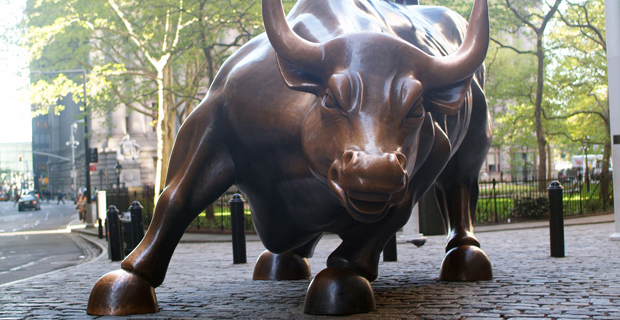 What do you think of the Wall Street Bullâ€™s sweater?